I recently posted an observation about TailRank's reach statistics. Kevin corrected me on the interpretation of the Alexa data confirming that TailRank had been experiencing significant month over month growth. Greg Lindon recently posted visitor stats for Findory. We can compare this graph with the Alexa reach graph. 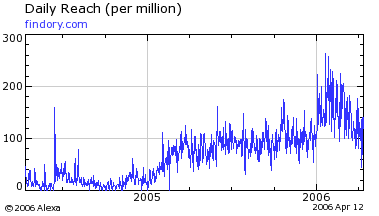 Alexa's reach stats are per million - delivering a normalized account of the number of visitors, essentially reporting the proportion of visitors for a site from the total online population as predicted by their sample base. However, the graphs still don't seem to add up. The last quarter for Findory has seen less growth than previously, however, I doubt it would result in the clear downward trend in reach as displayed by Alexa. The Findory stats are hits, not visitors, and include robots. 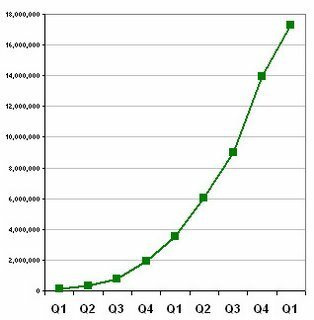 If we assume robots are a constant and that the number of pages viewed by each visitor is constant, then we can assume that the graph does track the growth of users. This does not fit the Alexa data, which can only be explained if, in Q1 2006, there was sudden growth in the online population with a bias to those not inclined to visit Findory. So what's going on? Is Alexa reliable?